I’ve been two Disney World twice before. Once when I was 10 in 1995 with family friends and once in 2001 when I went with the Troy High School Orchestras for competition. I remember that during the 2nd visit, Animal Kingdom had recently been completed and the fast pass system was just rolling out. 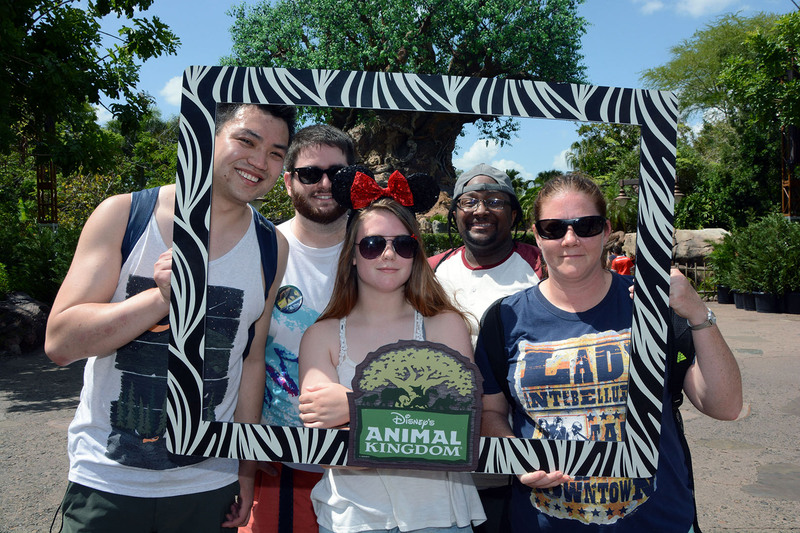 Animal kingdom is largely the same, but the fast pass system has made some leaps and bounds. My friend Brad and his friends figured out that you could press a button on the back of the fast pass kiosk back then, and it would spit out multiple fast passes. Now it’s built into your ticket package and you book your fast pass time on your phone, and it’s integrated into your magic band. I took this journey with Sean, Skyla, Lori, and Dante. Skyla, Dante, and Lori had never been to Disney World. Sean hadn’t been in over a decade (like myself). We stayed at the Fort Wilderness cabins. It was nice to have our own building with access to a 24 hour pool/hot tub. After arriving we settled in and prepared to go to Animal Kingdom. Of course the most prominent feature in Animal Kingdom is the Tree of Life. It’s visible throughout the park, and it’s got all sorts of animals carved into it. It’s presence merely reminds you of the magic that Disney has gone through the effort of creating in their theme parks. Animal Kingdom has a dinosaur area that we ventured into. We went on a couple rides, but the Dinosaur ride has a photo op that we saved to our memories package. Of course being animal kingdom, there was wildlife everywhere in their enclosures and on their safari ride. It was nice to see the animals roaming around, and even though they are in captivity, it seemed like they had more room than at a typical zoo. They seemed content to lounge about and eat/laze in the sun. We explored the Tibet themed area where Expedition Everest was located. There was a river rapids ride that I remembered riding in high school, that since we were near park close the attendants let us just stay on and go through again – fond memories. I was happy and disappointed to not have gotten as wet as I remember getting when I was 15. Dante picked an amazing seafood place in Disney Springs for dinner. Paddlefish was very good. We grabbed a handful of appetizers. Fried green tomatoes (which I will always order at any restaurant), crab poutine, and fried lobster. For my main course I saw they had cod en papillote. I had to google what it meant, but after I discovered what it was I was veritably excited. On Shokugeki no Soma, they had a dish that was basically en papillote, so I had to try it out. Everything was so moist and delicious, I need to cook some seafood like this soon! After dinner, we walked around Disney Springs and checked out the various stores. The LEGO store was especially fun. They had some awesome LEGO statues we took pictures with. I had the idea I’d do a post for each day, the day after. But there’s so much walking and so little time. Walking 20k+ steps a day really takes it out of you. So I’ll just have to backdate everything!